At Duke, MBAs focused on Energy & Environment (E&E) have a wealth of opportunities to engage beyond the classroom. One of the best ways Duke MBA students can build skills, industry knowledge and relationships to excel in careers in energy and environment is to engage directly with companies on real-world projects while a student. We know the importance of opening the doors to these opportunities for students and we believe that the chance to work on applied projects is one of the things that sets Duke’s program apart from other business schools. Students can join clubs including the Duke MBA Energy Club, Net Impact Club, Food & Ag Club, and MEM/MBA Club at Fuqua; and get involved with campus-wide organizations like the Duke University Energy Initiative. The annual Duke MBA Energy Conference and Duke Sustainable Business & Social Impact Conference at Duke’s Fuqua School of Business explore industry trends and key issues in energy and corporate sustainability. 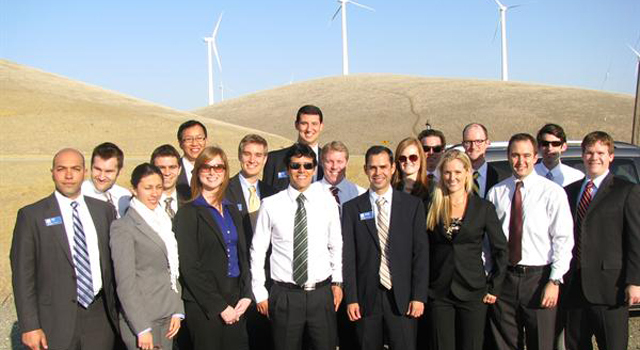 The Duke MBA Energy Club organizes two energy industry-focused trips—one to Houston and one to San Francisco—each year for networking, site visits, and speakers. Similarly, the Net Impact Club organizes a trip focused on sustainability and social impact careers (location varies each year). MBA students may also travel as part of an energy-oriented project in the Fuqua Client Consulting Practicum program. EDGE-sponsored speakers and networking events connect students with industry leaders. Past speakers have included Aubrey McLendon, CEO of Chesapeake Energy; John Replogle, CEO of Seventh Generation; and Hannah Jones, VP of Sustainable Business & Innovation at Nike. EDGE also brings in speakers as part of the EDGE Seminar class and in conjunction with our EDGE Advisory Board meetings. The Duke University Energy Initiative, a campus-wide initiative to support energy education, also hosts dozens of events each year. Some of these are open to the general public, while others are experiences for students only. 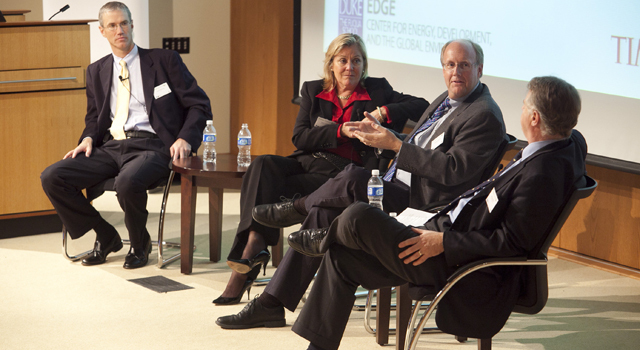 Fuqua hosts an annual Energy in Emerging Markets Case Competition. Duke students also compete with the best and brightest MBAs globally in competitions like the Ross Renewable Energy Case Competition, Leeds Net Impact Case Competition, and the UNC Invest for Impact Competition. Through the Fuqua Client Consulting Practicum program, students work in teams on projects for global clients. Through our network, EDGE identifies and develops Energy & Environment projects in this program and advises student teams on these projects. Recent examples include projects for NextEra Energy Resources, ABB, GE, Walmart, Alliance to Save Energy, and Enovation Partners. In the Fuqua On Board program, students gain leadership expertise by serving on the board of local nonprofit organizations like the Eno River Association and Clean Energy Durham. Students who are interested in working on or launching their own entrepreneurial ventures can participate in the Duke Program for Entrepreneurs. There is also an Energy & Environment track in the Duke Startup Challenge, an annual business plan pitch competition. EDGE actively works to connect students with E&E industry companies for research assignments and class projects during the year. Examples include projects for The Nature Conservancy, The Sustainability Consortium, Claremont Creek Ventures, and Clean Pacific Ventures.